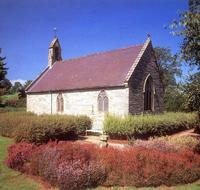 These delightful religious sites are located close together in beautiful countryside just west of Corwen. Rug is a rare example of a little-altered private 17th century chapel. Its founder was Colonel William Salisbury who was the royalist governor of Denbigh Castle during the Civil War. The Chapel's plain exterior gives little hint of the riches within, an interior which reflects the Colonel's "high church" religious views. A rood screen (added in the 19th century) separated clergy from congregation, members of which could feast their eyes on carved wooden angels and an elaborate roof decorated from end to end. Nothing is spared the artist's hand, not even the beams, which are painted with intertwining rose motifs. There is more carving to admire at ground level, in the altar rails, family pews, painted gallery and bench ends. As a counterpart to this exuberance, a ghoulish wall painting of a recumbent skeleton serves as a reminder of mortality. This wonderful little building makes a large impact on its visitors. Architect Sir Edwin Lutyens wrote that the chapel influenced his work, including his most spectacular commission, the Viceroy's House built in New Delhi, built 1912-30. Llangar Church is even older than Rug. This small medieval building stands in an idyllic setting a mile or so south of Rug overlooking the confluence of the Dee and Alwen rivers. Like Rug, Llangar takes visitors back to another age. The church, superseded by a new one at nearby Cynwryd in the 1850s, retains many ancient features, including extensive 15th century wall paintings, an 18th century figure of death, old beams, box pews, pulpit and minstrels' gallery. Rug Chapel: Off A494 2km/1.2mls N.West of Corwen. Llangar Church: Follow A5 north-west out of Corwen towards B4401. 2km/1.2mls S.West of Corwen.